Having missed out on last season’s home tie against Barcelona in the Champions League, I think yesterday provided the briefest of hints of what a home European tie at the Emirates can be like. Of course Captain Vantastic did the business again, and we’re through to the knockout stage, with a job well done, but something else troubled me early on. 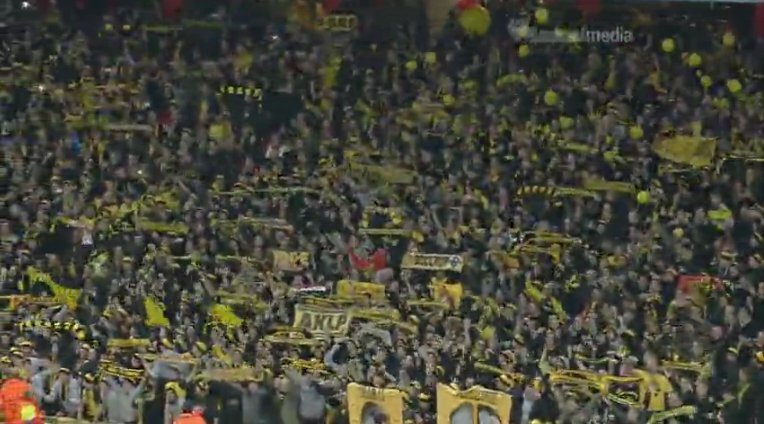 And that was how the Dortmund fans out-sang us Gooners for much of the game. I know away fans are usually loud, but the synchronised lake of yellow and black, was an incredible sight to behold, and more than once distracted me from an uninspiring start by Arsenal. A variety of co-ordinated sing-alongs, and hand claps – including a rendition of what sounded like Roll Out The Barrel – echoed from the corner of the Clock-End and East Bank, reaching us North Bank residents with little in the way of reply. We tried our usual volume, but the Emirates wasn’t taking. Did the Dortmund game go to General Sale? I’m not sure. Perhaps people gave up trying to get to the game due to Underground delays, that accounted for the empty seats and so the lack of noise. Whatever it was, the Arsenal faithful were largely quiet. Until we scored. Alex Song showed almost unbelievable (and somewhat uncharacteristic) style in passing three Dortmund players, and clipping a smart cross met by an RVP header that proved too powerful for Weidenfeller. And then the songs rang out, quite literally. ONE SONG! We’ve only got ONE SONG! Robin Van Persie! Robin Van Persie! Sing When You’re Winning – You Only Sing When Your Winning! I allowed myself a – perhaps, knowing – chuckle. Jimmy Nail’s hat on his head. Bang on. Much of the Emirates last night only sang when we were winning. The support before was somewhat lacking, but afterwards you couldn’t shut us up. We went two up and the Dortmund fans kept singing. Then when Borussia pulled one back at the death, I could almost hear the collective gasp. The potential “Oh No” , and the fear we’d let another slip. I don’t know what it is, but we seem to be progressing so quickly as a team that the fans on a match day (and I’m guilty too) are very quick to moan an complain, while fearing for our footballing sanity at the very slightest of slip ups. The team’s duty is to do its best on the pitch, but isn’t ours duty to do the best off it? The one thing we need in 60,000 seater is atmosphere and support. Not everyone, but even half would be astonishing. After all, last night proved what 9,000 can do – even if they were wearing yellow and black.